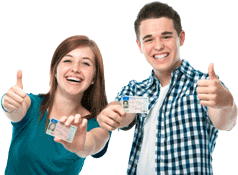 Guelph Driving School offers MTO approved beginner driver education (BDE) course, designed for drivers of all ages. BDE course includes, 20 hours in class, 10 hours in car, 10 hours homework. Our MTO approved driving course, reduces the road test waiting period from 12 months to 8 months. After completing the BDE course the student will get certificate (Driver License History) it will be issued by Service Ontario which is acceptable by most of auto insurance industries for lower insurance rate. We are here to help you learn the rules of the road, and guide you to become a safe and defensive driver. Our aim is to provide new drivers with knowledge, skills and most importantly, the correct attitude necessary to become safe and responsible drivers. Our courses are available year round; we offer weekend classes, evening classes and 4 day holiday classes as well. If you are unable to attend a session you can always make it up at any point during within a period of one year. For the in class sessions we discuss new topics of driving through videos, books, articles and test papers. Our class room facility is equipped with most modern training materials & technology. All our in-car and in-class instructors are Ministry approved & have passed criminal record check. Our instructors are very friendly and patient; our instructor’s schedules are flexible and very accommodating to the schedule of our students. All in car appointments are held one to one bases between the student and instructor.